What does today's Federal District Court ruling in Doe v. Trump blocking the ban mean? What just happened on the transgender ban in the U.S. military? The U.S. District Court for the District of Columbia ruled today, October 30, 2017, that President Trump may not bar transgender people from serving in the military. The decision was issued in the case of Doe v. Trump, the first lawsuit brought to challenge President Trump’s discriminatory ban in a case in which Plaintiffs are represented by the National Center for Lesbian Rights (NCLR) and GLBTQ Legal Advocates & Defenders (GLAD). What did the Federal District Court rule and what does it mean for transgender service members? We sought – and won – a “preliminary injunction” that prohibits the Trump administration from banning transgender people from enlisting and serving in the military. The Court put back in place military policy that existed prior to changes made by the Trump administration beginning with a tweet in July 2017 and followed by a White House memorandum issued in August 2017. 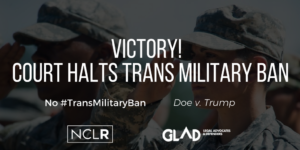 The Court order means that the military cannot take any actions to discharge or treat unfavorably any transgender people who are currently serving in any branch of the military or in the Coast Guard. The Court order also means that as of January 1, 2018, transgender people will be able to enlist and commission in the military. Practically speaking, for currently serving transgender service members, this means no one can be kicked out of the military or treated unfairly in the military because of their status as a transgender person. Any necessary medical care for people in active service must be provided as was the policy for active service members prior to any of the challenged changes made by the Trump administration. In addition, qualified transgender persons who seek to join the military may do so as of January 1, 2018 if they are otherwise qualified to serve. Is the President’s Memorandum of August 25, 2017 that prohibited transgender people from actively serving after March 23, 2018, still in effect? No. The Court found that policy was unconstitutional and may not be enforced. Does the military have to provide gender transition-related care, including surgeries, for transgender service members in active service? Yes. The Court order reinstates the status quo that existed prior to the changes made by Trump from the time of his Tweets in July until the date of the order. The Court specifically said that it was reinstating the “Directive-type Memorandum or DTM” issued in June 2016 that authorized open service by transgender people. That DTM requires that transgender people in active service be on equal footing with others including that appropriate medical care must be given to transgender people in active service. In fact, two of the Plaintiffs in the case have surgery either scheduled or in process for authorization. The military confirmed in pleadings filed with the Court that these surgeries will be go forward and will not be denied because of, or as a result of, any changes to military policy made by Trump. We would like to think that the President will abandon the effort to ban transgender service members now that the Court has spoken. However, it will not be surprising if the government appeals to the Court of Appeals for the District of Columbia and eventually to the United States Supreme Court. Any appeal is likely to be on a fast track. For now, however, the military may not ban transgender people who are in active service or take any steps to harm them. In addition to lead counsel from GLAD – Jennifer Levi, and NCLR – Shannon Minter, the plaintiffs are represented by a dedicated team of attorneys from the law firms of Wilmer Hale and Foley Hoag, LLP. Plaintiffs received support in the case from former Secretaries of the Army, Navy, and Air Force who were part of a Working Group that spent a year doing a comprehensive review of military policy and who, along with other military and civilian leaders and experts, were responsible for making the recommendation to allow transgender people to serve openly. How does this ruling affect other cases that have been brought? The judge’s decision applies to the military generally and is not limited to the Plaintiffs involved in the case. As a result, the Order applies to all transgender people currently serving and those who wish to serve, including Plaintiffs involved in the three other cases that have been brought similarly challenging the ban announced by President Trump. The judges in the other cases will have to decide how to incorporate this Court’s ruling into the decision-making in those cases.